i’m lovin this look; especially the headband, with the eye make-up it reminds me of a peacock. I’m loving these night shots. The subjects radiate vivacity. I agree, I also love the night shots and Osaka shots. She is so cute, and her style is simple compared to some Tokyoite’s, but still great. @Theo and Lactose Intoler-Art: I got myself the Nikon D3s in January, which has made it possible to shoot in the dark without using any strobes and still get excellent results. Maybe I should try more night shots, but I am really a morning person! I’ve been wondering what kind of camera/lenses you and the JS crew use to shoot the street fashion pics. The D3s – that’s a heavy-duty camera! @Theo: Yes, the D3s is a true workhorse. I love how it handles lack of light, and how sharp the images turn out. i love this outfit! allways love the make-up. She looks sweet :) Her leather booties are my fav! @Mel: Zara is huge in Japan; they’re everywhere here. @julie: LOL! You should do a Google search on your spelling error. I found more than 6,000 pages for insoiration. You are not alone! HEY, I´m tired of spelling wrong! but I mean what I´m ‘trying’ to say..
Love this! Comfy-cute is the way to go. Plus, the leggings allow you to bend over in public :D Would love to know what her shirt says, though. 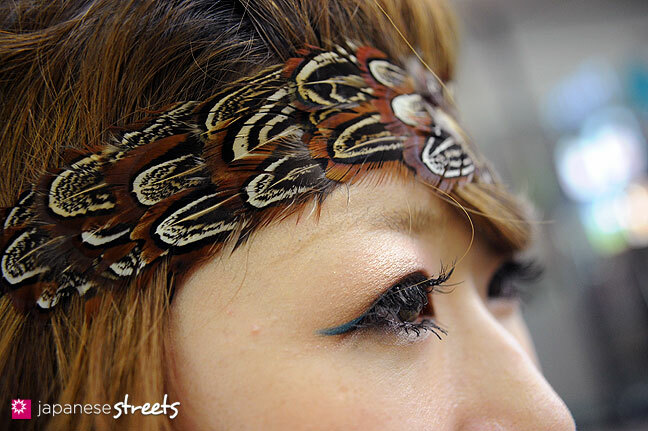 Also, feathers are by far my favorite trend of this year [decade?]! ZARA, is like awesome. her style? is like WOW! this outfit just look awesome, it’s comfortable, and ready-to-wear, and also, stylish, it’s like something that everyone been searching for! Cool. Some kind of hippy/yoga-bunny thing going on here… I like it! @julie: No problem. We all make typos. @petitesam: If I remember correctly, the t-shirt said Drunk Story. 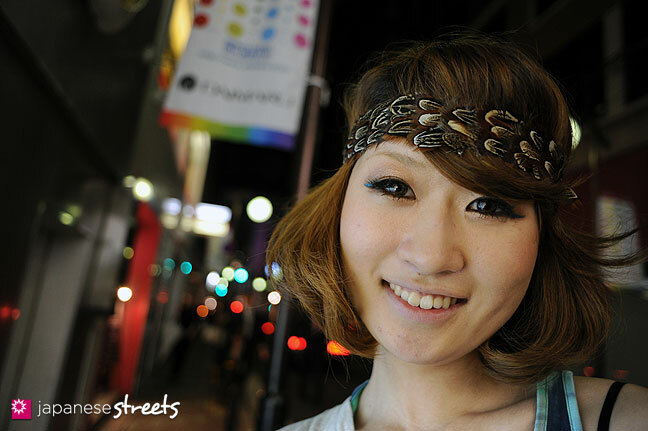 This kind of headband has been popular in Japan for two years or so now. Feathers, rope, shells, leather, hair, all kinds of materials are used. I did an article on headbands made of hair almost exactly one year ago. @nanaa: Glad you like Osaka. It is a bit more difficult to find people to shoot here than in Tokyo’s Harajuku and Shibuya, but spend enough time on the street and eventually you will find them. i LOVE how the headband almost looks blended in w/ her real hair. @Ruby Rocks: I love that hairband, too. Beautiful, and very sensual. @Kjeld at 1st glance in the preview it looked metal almost. @Ruby Rocks: It does, doesn’t it!